I can't figure this one out. Everything was fine just before a restart but then the server gets to 'Reading Mission' stage and shuts down. 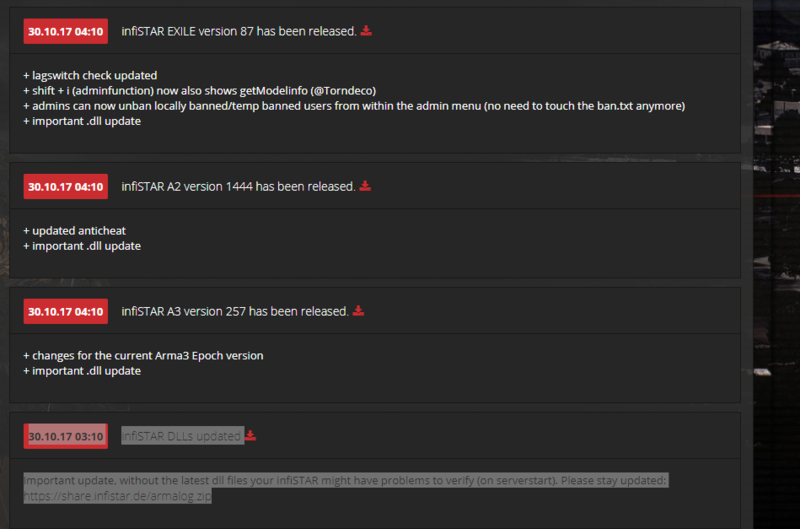 However, If I remove infiSTAR from @ExileServer/addons the server works. ??? 29.10.2017 22:52:55: Remove the infiSTAR files or you won't be able to start the server! Did that, Still getting the shutdown... strange. though I haven't touched my database. I unblocked the dlls in the new infistar. In fact I updated the whole thing. Still crashing the server with the errors I posted earlier. Installed the latest infiSTAR and updated the DLLs but the server still isn't visible online and I cannot connect using Dart or even your RCon Tool. Everything was working perfectly and then BLAM! F**kin, Arma. Question... I have infiSTAR as a server mod so I have the PBO in @Exile_Server, not the @A3_infiSTAR folder in the server root. It's how I've had it for the past year or so and it's worked fine like that. Should I be using the @A3_infiSTAR mod folder instead?